Next weekend, residents of southern Minnesota should watch for a black bus painted with the words "Obama's Failing Agenda Tour." The bus is owned by Americans for Prosperity, a Washington, D.C.-based group founded by wealthy conservative donors Charles and David Koch that is playing a major role in this year's presidential election. 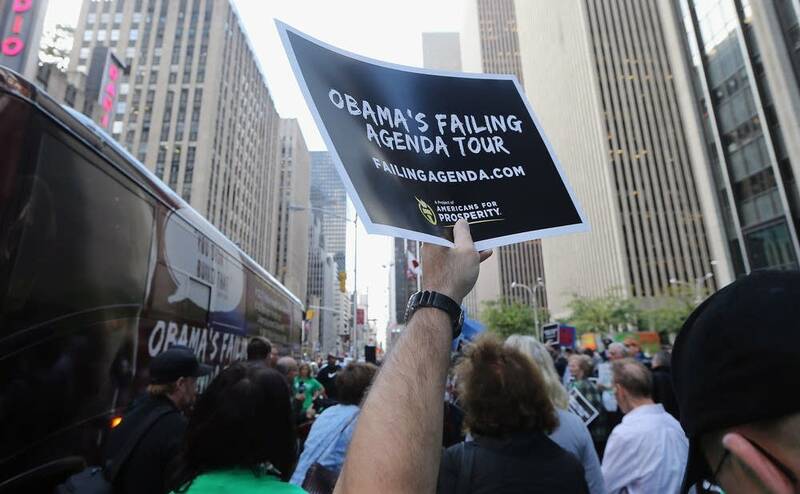 In addition to a nationwide bus tour condemning President Barack Obama's economic policies, the political action committee has spent millions on television ads that criticize the president's record, including in Minnesota. Americans for Prosperity is just one of at least 11 organizations that are pouring cash into Minnesota's elections, from the state Legislature to the top of the ticket. An MPR News analysis estimates that such groups have committed to spend at least $6 million in Minnesota, a massive figure that echoes a national trend as super PACs and non-profits raise and spend larger amounts on political races. At the same time, Americans for Prosperity is quietly establishing a long-term presence in the state. The group opened a Minnesota office last year, and has hosted tax day rallies, conducted a poll on the Minnesota Vikings stadium debate and backed candidates for the state Legislature. Dropping hundreds of thousands on ads may affect an election, but they do little to shift public sentiment beyond November, said John Cooney, who leads Americans for Prosperity's Minnesota branch. "We're aggressively discussing policy, but we want to create the infrastructure so that we've got an active grassroots organization engaged not just on federal issues, but with state policy makers and local policy makers," Cooney said. It's a strategy that at least two other groups also are following. The conservative American Action Network, for example, is investing substantially in ads meant to help Republican U.S. Rep. Chip Cravaack secure the 8th Congressional District seat for the second time. But the American Action Network also has plans to open a local office. That's because the operation sees an opportunity to make Minnesota a reliably conservative state in the long-run, said former U.S. Sen. Norm Coleman, a co-founder of the group. "We're not just a Washington organization," Coleman said. "If you're going to do grassroots, if you're going to do changing people or educating people so that their hearts and minds are focused in a center-right direction, it has to be more than what happens on the air. It's got to be what happens on the ground." Minnesota's 8th Congressional District, where Cravaack is defending his seat against Democrat Rick Nolan, has become ground zero for political spending. It's one of the most competitive races in the country, according to the Rothenberg Political Report. Already, U.S. House Democrats have pledged to spend $2.8 million on ads in Minnesota, while House Republicans have put up $1.2 million for airtime. At the same time, House Majority PAC, a new super PAC aimed at electing Democrats to the U.S. House, has teamed up with various labor groups to spend more than $900,000 on advertising and polling. Right now, that money is focused on the Cravaack-Nolan race, but it could spread to other Minnesota races, too. Some outside groups are taking a different approach that doesn't rely on ads and polling. CREDO PAC, a liberal super PAC based in San Francisco has spent nearly $147,000 so far this year to train and organize volunteers, door-knock and phone-bank in Minnesota's 8th, according to campaign finance reports. Aiming to defeat Republican U.S. Rep. Michele Bachmann, the group will be starting a similar effort in Minnesota's 6th Congressional District. Becky Bond, CREDO PAC's political director, said her group's approach is less expensive and potentially longer-lasting than advertisements. Volunteers organized to defeat Cravaack and Bachmann this year will fight policies they disagree with in the future, regardless of who's in office, she said. "We feel like anything we do in the context of elections, it needs to be not just in support of the goal of that election, which in Minnesota is to defeat Chip Cravaack and Michele Bachman, but it's also to fight for the survival of 'little d' democracy," Bond said. Though CREDO PAC and Americans for Prosperity may not share the same political views, they do share similar political strategies. The national arm of Americans for Prosperity has spent at least $500,000 on ads in Minnesota criticizing the president's record, but the group is also working on legislative races and policy through the state office. What's been happening in Minnesota reflects Americans for Prosperity's broader strategy of focusing on local issues through its 34 state chapters and counting on incremental change, spokesman Levi Russell said. Small victories can add up to produce a long-term effect on how people think about the economy. "We want [voters] to have an ongoing awareness for free-market issues so that they can make daily decisions that impact that and not wait until it is election time," Russell said. Coleman's American Action Network is taking a similar approach, committing $1 million to Minnesota in reserved airtime, mail, print ads and robocalls. But that figure doesn't include a chunk of the $10 million the American Action Network has set aside for its "orphan state" effort, a network of affiliates in states where local parties are weak. Enter the Minnesota Action Network, which will be led by former Republican state Rep. Laura Brod. Its goal will be to persuade voters to take a center-right view on the economy, the debt and deficit, voter identification and the new health care law, Coleman said. Typically, political parties do some of that work. But Minnesota's financially weakened Republican Party created an opportunity for the American Action Network to put down roots here, Coleman said. Due to changes in campaign finance law, groups like his are raising and spending more money than political parties, and they can be choosier about the issues and candidates they support. "I can focus more on the economic issues and say 'that's going to be our focus, 'or national security and say 'that's going to be our focus,'" Coleman said. "Political parties have a much broader universe; they've got to respond to the concerns of every element in the party." Nationwide, political parties are being outsourced to special interest groups, University of Minnesota political science professor Larry Jacobs said. "Put yourself in the position of a funder who is very intense about taxes or regulation or a social issue," Jacobs said. "Rather than having to give to a catch-all organization that will do a lot of things that you're not particularly interested in, namely political parties, you can target your money to the specific issue and the specific set of activities that you want to support." Whether any of these groups can have a long-term impact on the politics of the state is another question all together, said Todd Rapp, president of public relations firm Himle Rapp. While Minnesota is decidedly blue when it comes to presidential elections, that's not the case in local races. That means third-party groups interested in who controls Congress or that want to flip state legislatures can't ignore places like Minnesota, Rapp said. "What's going on in Minnesota right now is absolutely a crossroads," Rapp said. "A group like the American Action Network is looking at Minnesota and they're saying that the primary growth that's happening in Minnesota is happening in swing areas of the state. It is not in the most important Democratic markets here or in the most important Republican markets, so they're saying it's ripe for the taking."